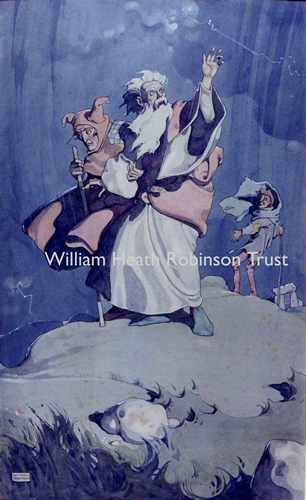 An unpublished illustration for King Lear. One of the first projects of the publishing house of Jonathan Cape was to be The Works of Shakespeare illustrated by W Heath Robinson. Work started on the commission in January 1921 and the drawings were finally completed in June 1922, but either because of the lack of a US partner, or because of the declining market for illustrated books, the edition was never published. Published in Hans Andersens Fairy Tales. This drawing illustrates a scene in the Fifth Part of “The Snow Queen’. It was coloured for exhibition after publication of the book. 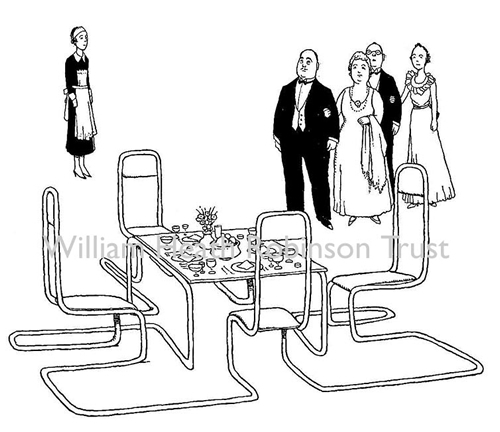 The one-piece chromium steel dining suite. Robinson and KRG Browne, Hutchinson & Co, 1936. The book has an extended section which explores the possibilities of tubular steel furniture, including a chair with a tap on the side providing a continuous supply of beer through the tubular frame from a barrel in the basement below. Installing the electric telegraph between Paddington and Slough. Published in Railway Ribaldry by William Heath Robinson, GWR, Paddington Station, 1935. 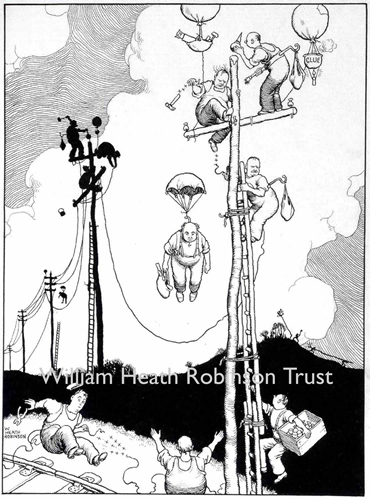 In 1935 the Great Western Railway Company commissioned Heath Robinson to make a collection of drawings illustrating the history of the company to mark its 150th anniversary. Roof hiking in a modern flat. 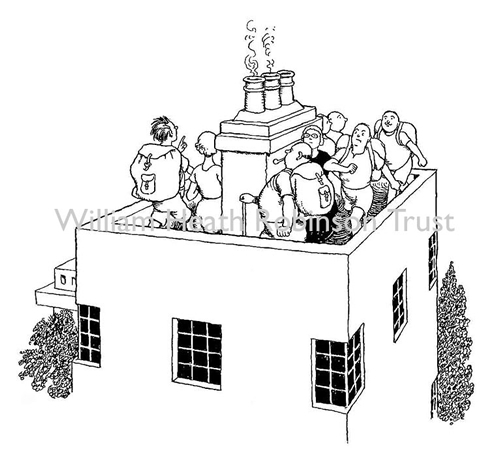 Published in How to Live in a Flat by W Heath Robinson and KRG Browne, Hutchinson & Co, 1936. Published in Holly Leaves, Dec 1925, p21. 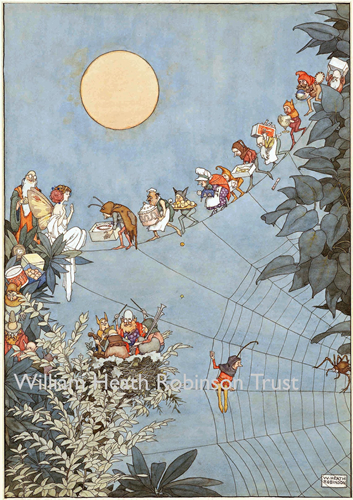 Heath Robinson’s goblins appeared in the Christmas Numbers of a variety of magazines between 1919 and 1929. They are distinguished by their homely and somewhat bumbling appearance. They may be short-sighted, overweight and suffer from pains in their joints or shortness of breath. They have a rustic quality and may well have been based on the characters that Heath Robinson met in and around Cranleigh. Pen and ink. Coloured later for exhibition. Published in The Adventures of Uncle Lubin, 1902, pp60-61. Uncle Lubin determined to look for little Peter in the depths of the sea, so he built himself a submarine. 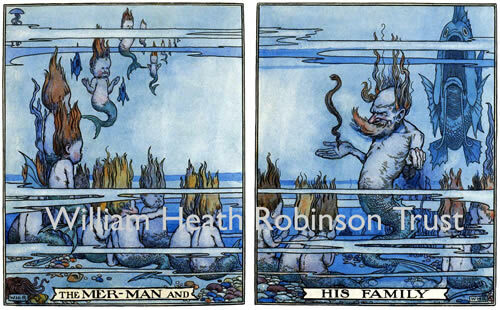 One day he came upon a shoal of little mer-children. One little mer-boy told him a sad story. “Until quite lately,” he said, “I and my brothers went to a school kept by a very wise old mer-man, who did his best to teach us all we ought to know. . .